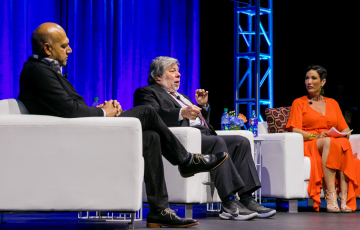 On April 2, Pepperdine Graziadio Business School hosted a historic event celebrating a new era in business and a momentous occasion for the business school. Industry 4.0: The Future of Humanity in the Smart Machine Age, brought together world class leaders and breakthrough ideas on Tuesday, April 2 at the Novo in Downtown Los Angeles. The event started with inspiring words from Pepperdine Graziadio Dean Deryck J. van Rensburg who paid tribute to the school’s past achievements such as being one of the first West Coast business schools, producing some of the world’s highest level executives and leading the way in teaching ethical business practices. Industry 4.0 also focused on the road ahead. Speakers discussed the defining spirit and mood of the current era as shown by the ideas, beliefs and practices taking shape in the business world. Attendees also heard, discussed and learned what it means to be human in the age of automation. Bob Johansen, Distinguished Fellow and Past President, Institute for the Future described the new cognitive framework driving management and leadership, which he labeled full-spectrum thinking in his remarks. This approach requires developing a mindset that recognizes the need to simultaneously deal with multiple challenges in an integrated fashion in support of a broad range of focused interests. It also includes integration of insights gleaned from massive data capabilities and artificial intelligence. Johansen, whose organization produces a 10-year forecast on the Future of Work Skills, described how global connectivity, smart machines, and new media are just some of the drivers reshaping how we think about work, what constitutes work, and the skills we will need to be productive contributors in the future. He expressed optimism in the up-and-coming generation, younger than 23 years old, who are primed to adjust to convergent thinking and completely comfortable with data and technology. There was also an inspiring discussion about how the fourth Industrial Revolution requires fresh leadership perspectives and why women are poised to succeed as a result. Moderated by Denise Roberson, President of Jadi Communications, this panel featured Dalana Brand, Vice President of People Rewards and Experience, Twitter; Alison Lewis, Chief Marketing Officer, Johnson & Johnson Consumer, Inc.; and Britta Wilson, Vice President of Inclusion Strategies, Pixar. This accomplished group of women shared their career highlights, observations for the future and advice for aspiring women leaders. Brand, Lewis and Wilson described how women are inadvertently put into stereotypical roles and that we all can play a part in eliminating gender discrimination. Lewis stressed that we are living in a world of ambiguity and because of that you may not have all the answers and will need to take a leap of faith. 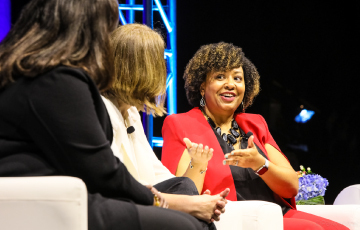 Brand said that while tech skills are becoming increasingly important a key driver of success is collaboration, a trait women overwhelming possess. Wilson said that women leaders have a responsibility to not only tell their story, but to serve as sponsors and mentors for more junior women. They also said that companies can help women find the right work life blend and advised women to not be driven by fear, but to be bold and “raise their hands” as that is the best way to learn, grow and become a stronger leader. In the afternoon, a distinguished panel of thought leaders, moderated by Allen Webb, Editor McKinsey Quarterly, discussed purpose, meaning and navigating dynamic change. Panel members included Ed Hess, Author, Professor at Darden School of Business; Andrei Cherny, Founder and CEO, Aspiration; John Figueroa, Former CEO, Genoa Healthcare; Alex Grimwade, Senior Vice President and Chief Information Officer, Twentieth Century Fox Television; Lindsay Moran, Head of Communications for the Environmental Investigation Agency. The panel addressed the shift in the last 50 years in which business went from being an integral part of the community in the past era to the profit-above-all-else mentality of the current era. However, Cherny noted that the tone is starting to shift again with business leaders such as Jamie Dimon and Warren Buffett urging businesses to consider the human impact of their business. The consensus among panel members was that the underpinnings of a productive economy include being a Best for the World leader alongside serving shareholders, employees and the community. For more information about Pepperdine Graziadio Business School please visit our website. We have programs that can benefit professionals in any stage in their career; from those just starting out, to experienced professionals seeking to move up to experienced senior executives who seek a peer-to-peer learning experience. It truly was an inspiring day and I hope that you can join us for future Pepperdine Graziadio events.